Jody McIntyre: What was Fuad like? At home he was always on his computer — he bought it independently, refusing to allow me to contribute anything to the cost. Fuad was always keen on looking the part, dressing nicely and playing with his hair. I don’t know if there was a girl he liked. If there was he was too shy to tell us. Fuad was a very quiet boy; he never made problems with anyone. JM: When was the last time you saw Fuad? MT: The last time I spoke to Fuad, he said that he was keen to finish school so that he could get married. I told him that after your brother is released from jail [Fuad’s older brother has 12 months of a six-year sentence remaining] I want to make a big party for both of you. A woman who lives near us recently traveled to Mecca, and when she got back she gave Fuad a necklace. She told him to wear it because she was afraid that something bad was going to happen to him — that was two days before he was killed. JM: Where were you when you heard the news? MT: On the day Fuad was killed, I was trying to get permission to visit his brother in prison. Fuad’s uncle called and told me that something had happened at to my son at the school, and that they were at the hospital and I should try to come as quickly as possible, but he told me that Fuad was fine. He didn’t want me to face the pain alone. When I got to the hospital, I could see that my son was in bad shape — many tubes were stuck into his body and nose, but he was still alive. But when I went to stroke Fuad’s arms, I could feel him dying inside. I quickly recited a passage from the Quran, to ask God to take my son to heaven. The rest of the family arrived to see Fuad, but the doctors took him away to another room to perform surgery. Unfortunately, it was too late. JM: Was anyone at the scene when he was injured? MT: Fuad was standing on the road [of his school] with a group of friends, when the Israeli military jeep suddenly swerved left off the main road toward them. All of his friends jumped out of the way in shock, but Fuad stayed where he was — he stuck his hands in the air and waved his arms for the jeep to stop. JM: Why do you think Fuad was killed? MT: Why? Because he is Palestinian. As the soldiers said, this is normal. The Israeli army doesn’t care about the life of any Palestinian, so this can happen any time — they can kill anyone they like. When they ran Fuad over, they didn’t even look under the jeep to see what had happened, but were more interested in closing the school gate so that nobody could help him. They then called three more jeeps for back-up, and when they drove away, the jeep rode over Fuad’s body, still trapped underneath, for a fourth time! This shows their blatant disregard for the lives of Palestinian boys. One of Fuad’s brothers, also a student at the school, saw this and jumped over the school gate to help Fuad, so the soldiers started kicking him and beating him with their guns until he was bleeding from his wounds. They didn’t care — they had murdered one boy, and then they wanted to kill his brother as well. Fuad was left alone for 40 minutes. He wasn’t dead yet, but nobody was allowed forward to help. Afterwards, the soldiers told the teachers that the whole thing was an accident, but still didn’t even have the decency to call an ambulance, even though they had one on call just two minutes away. 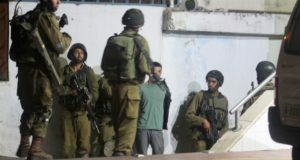 Only once the soldiers thought Fuad was dead did they re-open the school gate and let the people inside go to help him. Maybe if the soldiers had shot my son I would be able to come to terms with his death, but for it to have happened in such an undignified manner is very difficult for me to comprehend. The road he was standing on is only for the school, and is around 40 meters away from the main road, so when they swerved left so sharply, they did it because they wanted to kill someone. By the time they had run over his body so many times, Fuad’s liver was lying on the pavement. My brother wrapped it in plastic so that I wouldn’t have to see it. During the second intifada, there was an accident here in Yabad where an Israeli jeep lost control and flipped over. My brother, Fuad’s uncle, saw this happen and went to help them, calling an ambulance and even helping to retrieve their weapons. The soldiers had been involved in an accident, not fighting, and you help anyone in an accident. But when Fuad was lying on the ground, close to his death, and the soldiers claimed it was an accident, they had no interest in calling an ambulance. Furthermore, every Israeli military vehicle has someone who is trained in first aid, in case one of the soldiers is injured, but they refused to help Fuad. 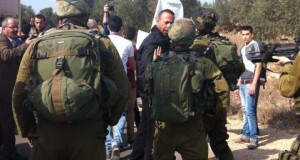 All the teachers had cars to drive Fuad to the hospital, but the soldiers prevented them from doing so. Now, none of the students want to go back to school, because they are afraid that they will be the next victim of this occupation. All the fathers want to send their children to different schools. JM: How has his death affected family life? MT: In many ways! Fuad was great with the family, and got along with all of his brothers and sisters. Now, when I walk through the house and see all of his things still lying where they were — his bed, his computer, his clothes — I feel like he is still here with us. Fuad’s youngest brother is three years old, and he used to go to Fuad when he was on his computer and ask him to play music so he could dance to it. Every time Fuad walked through the front gate to the house, he would run to hug him. Now he always asks me, “Where is Fuad? I miss Fuad — I want Fuad here!” I told him that Fuad has gone to heaven. All his brothers and sisters loved him immensely, and they are so, so sad that they will never see him again. JM: What were Fuad’s political views? MT: Fuad always told me that he thought we could make peace here in Palestine. He hated to see the fighting between Palestinians and Israelis, and desperately yearned for freedom; to be able to go anywhere he wanted, without walls or checkpoints blocking his path. He wanted peace, because it would mean that he could go to school without being afraid. JM: What would you say to world leaders? MT: We want peace. We need to find a solution where we live in freedom. We have a very difficult life here, and every Palestinian person is suffering. People are dying as they are held and beaten at checkpoints, children have been killed, pregnant women with their babies still in their bellies have been murdered, so the world needs to help. JM: Fadi, how do you remember your older brother? Fadi Turkman: I keep seeing Fuad in my dreams, playing and joking with us. I was in class at school when my teacher said to me, “Go to your house, your brother has died.” I ran all the way home and when I got there I started crying. Fuad always helped me with my school work … in fact, we helped each other. He let me play on his computer. We went to the mosque together. The night before he died, Fuad was here at the house playing with me and my friends. I always used to tell Fuad everything I wanted to do when I grew up, and he promised to take me everywhere in the world.